Looking for a 15 minute project that is great for beginners?! I got the perfect tutorial here for you today with these Easy Peasy Pompom Crochet Coasters!! 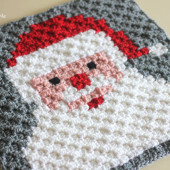 Although I can’t take credit for this crochet pattern as it was created by my neighbor Debbie! You may have seen Debbie pop up in my Instagram Stories but let me officially introduce her: Debbie lives directly across the street from me. Literally I walk out my front door and I stare straight at hers! She is always looking out for me and makes sure all my precious packages of yarn are safe when I’m not home for the delivery 🙂 She frequently takes blog pictures for me or helps me with video when I need a second hand (like the picture for THIS PROJECT). She comes over at least once a week in the morning to have coffee, chat, crochet, and gossip! 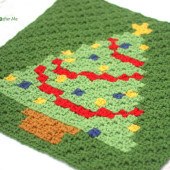 She dabbled in crochet, sewing, and quilting when her kids were younger and just recently she decided to dust off her hooks! Debbie is one of my biggest cheerleaders and is always motivating me and encouraging me with her pep talks and her genius marketing ideas. She will probably be pissed at me for posting this picture of her mid stitch LOL! But keep an eye on my social media pages because Debbie and I have talked about hosting some live tutorials! She is also working on setting up her own blog which I will link to as soon as it’s ready! Ok let’s get to the tutorial. – Bernat Super Value Yarn. Shop all colors HERE at Yarnspirations.com! Now create 4 tiny pom-poms. Use your fingers! See video below on how to make them! 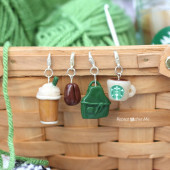 Enjoy your day with Coffee and Crochet! Aw, these are such darling coasters! I love the pom poms! I just love coffee. Therefore, I think I should make such pompom for the cup. Regards, Amanda, Writer at WritingCheap Company. The blog article is excellent. 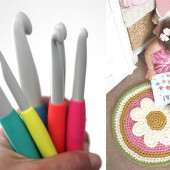 The article takes a look at the Easy Peasy Pompom Crochet Coasters. If you love new art items, you should go through the article. You can get to know about Easy Peasy Pompom Crochet Coasters and how to make It by reading the whole article. Here you will be glad to know that here we are having one of the best portal which will let you have methods to sync more settings windows 10 and will also show you path for using same settings in another windows 10. Try out for once.